Terriers will look to rebound from Saturday’s last-second loss to Quinnipiac as they host Merrimack today in Martin Luther King, Jr., matinee. 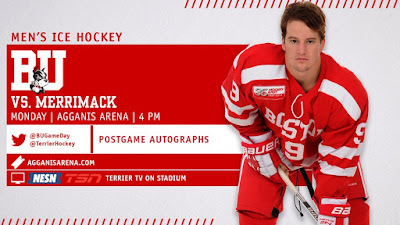 Puck drop at Agganis Arena is at 4 p.m. The game will be aired on NESN and TSN; viewers outside New England can watch the live stream on TerrierTV. The Warriors, who are coming off a 5-0 loss to New Hampshire, had defeated Michigan and Connecticut earlier this month. Back in October, the Warriors blanked BU, 4-0, for its first shutout in series history as goalie Craig Pantano stopped all 34 Terrier shots. Merrimack's offense is led by Junior Tyler Irvine with 16 points and freshman Chase Gresock with 15, including a team-high six goals. Blueliner Johnathan Kovacevic has 12 points. Pantano has split the netminding duties with Drew Vogler. BU, 2-1-1 in its four 2019 games, has seen increased scoring from its bottom six getting goals from Ty Amonte, Patrick Curry, Jack DeBoer and Matthew Quercia in recent games. Since returning from the World Junior Championships, Shane Bowers has produced six points (3G, 3A). NHL Central Scouting has issued its mid-term rankings. Eight BU recruits are among those on the North American ranking list: Trevor Zegras #7, Alex Vlasic #25, Case McCarthy #41, Braden Doyle #48, Robert Mastrosimone #49, Cade Webber #62 Domenick Fensore #89 and Ethan Phillips #91. Courtney Correia has been named Hockey East’s Rookie of the Week after contributing two goals –including Saturday’s game-winner—and two assists in the Terriers’ sweep of Holy Cross. Correira has 11 points overall, tied with Kaleigh Donnelly, for most among BU freshmen. Former BU assistant coach Katie Lachapelle has been named Head Coach at Holy Cross beginning with the 2019-20 season. After nine season’s assisting BU Coach Brian Durocher,she’s in her second season as a Crusaders’ assistant.